Russia has reportedly lost contact with its newest military satellite just hours after launching it into space today (Feb. 1), according to Russian reports. 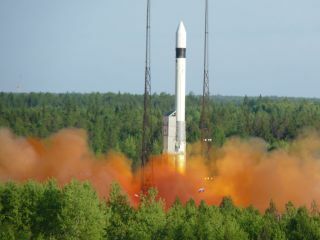 The satellite, called Geo-IK-2, blasted off atop a three-stage Rockot booster from Russia's northern Plesetsk Cosmodrome at about 5 p.m. Moscow Time (9 a.m. EST, 1400 GMT). But just two hours after liftoff, the satellite went missing, according to Russia's Itar-Tass and Interfax news agencies. "There is no contact with the satellite," Russia's Interfax-AVN news service quoted an unnamed Russian space industry source as saying. The Geo-IK-2 spacecraft is reportedly an Earth-observation satellite designed to build three-dimensional maps to aid the Russian military. It was expected to launch into a circular orbit about 600 miles (1,000 km) above the Earth, according to Agence France-Press. But the satellite did not enter the proper orbit, with some Russian reports suggesting its current flight path brings it as low as 205 miles (330 km) above the ground, AFP reported. The satellite launch failure comes just five weeks after Russian President Dmitry Medvedev fired two top-ranking space officials and reprimanded Anatoly Perminov, chief of Russia's Federal Space Agency, following the botched launch of a Proton rocket carrying three new navigation satellites. In the Dec. 5 launch failure, the Proton rocket's Block DM-3 upper stage was loaded with too much fuel. The basic miscalculation sent the Proton rocket off course. The new Glonass-M navigation satellites onboard that rocket crashed into the Pacific Ocean north of Hawaii. Today's launch failure, however, occurred on a different type of rocket. The Rockot booster design is based on components built for Russia's SS-16 intercontinental ballistic missiles. It has two core stages topped with a Breeze-KM upper stage used to send satellite payloads into their final orbits. According to Interfax, Russia's Defense Ministry is forming a commission to investigate today's launch failure. Russia's Federal Space Agency will form part of that commission, the news agency stated.